Stephen and Anne's life in pink: Hello customer Morten! We bought some coffee tables recently and they came in a big box. 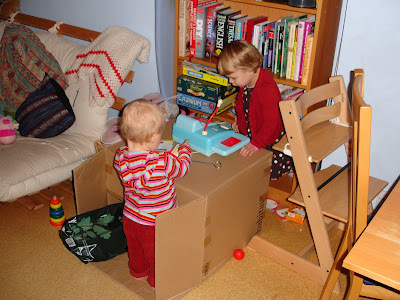 Having the box in the back room has given ThingOne and ThingTwo some fun. The coffee tables are gathering dust somewhere around the house, I imagine. 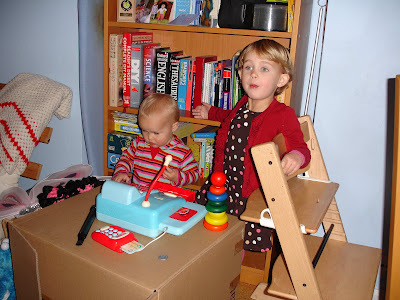 Recently they've started to play "shop" together with the till or "money pinger", as Lola (and so ThingOne) calls it. I don't know how much ThingTwo understands, but they play nicely together and it's very sweet. Occasionally I get roped into buying some tat or other. I'm a very patient customer.